All payments can be made with the most common debit and credit cards (VISA and MasterCard), or by purchasing or topping up a voucher at the park entrance or online. Don’t have a VISA or MasterCard? 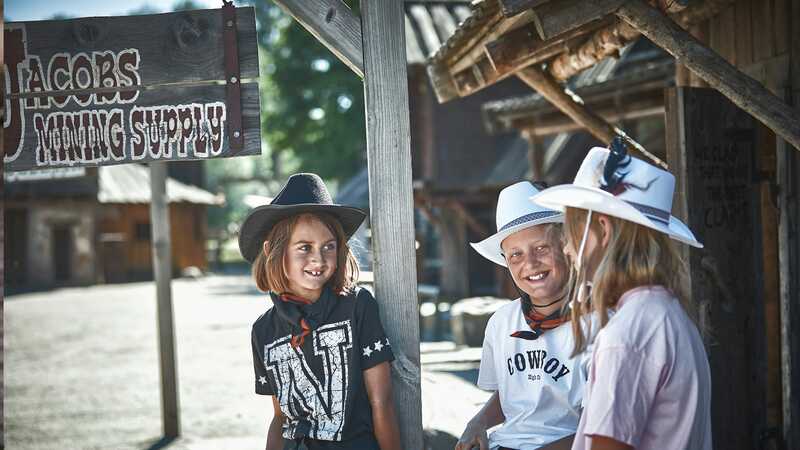 One of our entrance registers takes cash, allowing you to pay the entrance fee and top up the amount you want on High Chaparral’s own payment card. You can then use the card to make purchases in the park. When necessary, you can top up the amount on the card during the day. And when your visit is over, you can get the remaining amount back at the entrance register, at the bank or at the campsite. Your children can use the payment card to make purchases themselves inside the park, and it is easy for those who prefer to use only cash to visit the park. Available for rent just inside the entrance for 50 SEK. Dogs are allowed inside the park as long as they are on leash. You can get around pretty much everywhere in the park on a wheelchair. We have a number of designated parking spaces for people with disabilities. Disabled toilets are available at Restaurant Diligensen and inside the park entrance. As a companion or assistant to a disabled person, you have free admission to the park if you have a valid companion certificate with personal information about you as a companion and about the disabled guest. We require a certificate from a healthcare provider, care providing company or municipality. If a disabled guest brings along two companions, one of the companions pays the regular price of admission. The campsite has a lake for swimming. Inside the park there is a pool area with an unheated pool, a slide, a changing room with a shower and toilet, as well as sun loungers. Parking is free for guests staying in our cottages and at the Wild West Inn. Parking permits are available at the Wild West Inn reception. There are four parking spots reserved for EV parking. There are three along the wall (the long side of the first building) to the left when you enter the parking lot as well as one at the campsite. The chargers are type 2 Cable, 11kW. The distance from the campsite to the amusement park entrance is about 300 m.
The distance between the Wild West Inn and the park entrance is 40 m. The distance between the Gold Village and Corral cabin areas and the park entrance is about 100 m.
Located at the park entrance and at the Sheriff’s on Main Street just inside the park entrance. If you have lost something in the park, you can inquire about it at the bank, where we have a lost property station. If we have not yet located the item, we will take down information about it and your telephone number so that we can help you if it turns up. If your child gets lost, park staff will help you search for the child. The staff will take down your name, telephone number and information about the child, and will issue a public announcement so that all staff (and even visitors) can help look for the child. Our eateries offer several different options for allergy sufferers. You can always ask our staff if you have a question. Make sure to get a stamp at the park entrance before you leave the park, either at the Sheriff’s or at Rent a Trolley. If you bought one-day tickets and want to upgrade them, bring along your tickets and your receipt to the park entrance ticket counter and pay the difference to upgrade to a two-day ticket.